After adding some strength and beef in the off-season, Jayson comes in at about 6'8.5" and 212 pounds. Make no mistake, Al Horford and Aron Baynes will see the most minutes at center, with Daniel Theis and possibly Rob Williams getting some time at the five-spot. 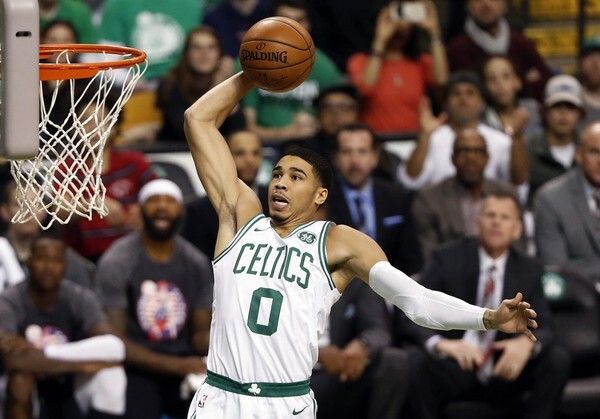 But there likely will be times when Stevens goes with a small line-up with Tatum at center, possibly surrounded by Kyrie Irving, Marcus Smart, Gordon Hayward and Jaylen Brown. Every guy on that unit can handle the ball, pass, drive, defend and shoot from distance. All five have the capability of playing the guard position. They would be a nightmare for many teams. Probably the most radical idea to come out of #Wizards’ training camp: the lean, mean Otto Porter Jr. playing minutes at the center. “It’s part of our strategy going into every game. It’s how we want to play,” Brooks said. “Whether it’s six, seven minutes of those lineups or 25, 30 minutes of those lineups, it’s all going to depend on how the lineups are playing that particular night. Brooks wasted little time in trying out another innovation. Guard Austin Rivers, in what he described as his first real training camp experience due to neck spasms that held him out of earlier sessions, spent part of Thursday playing alongside starting guards John Wall and Bradley Beal. Expect to see more line-up innovations from Brad, particularly early in the season. He has so many varied talents among his troops, there is almost a real need to experiment. Whatever happens this season, fans will not be bored.